City Sightseeing Tallinn welcome you to our beautiful capital. City Sightseeing Tallinn is present at the Cruise Terminal upon arrival of your Cruise Ship. A City Sightseeing tour bus will be present upon your arrival by the Cruise Terminal. Buses stop approximately 500 meters away from the ships towards the city center. When the first City Sightseeing tour bus has left the Cruise Pier another tour bus will pass every 20/30 minutes thereafter (until noon). In the afternoon busses pass each stop every 30/60 minutes. Please specify the schedule with our staff. The drop off stop of the cruise passengers is due to security regulations of Port of Tallinn located during the day behind (outside) the entrance gates to the pier (as seen from the ships). Also the pickup stop after 12.00 pm is located outside the gates. (Please note that all information here applies for cruise visitors arriving directly to Cruise Port and not to visitors with Cruise Ships staying in terminals of regular ship lines). If you decide to stay on board the Historic Center& Old Town tour bus for a complete city tour without getting off at any of the many sights, a full route of Tallinn lasts around 50 minutes. Should you want to spend more time on the tours and wish to see Pirita with TV Tower and historic suburbs like Kalamaja with the newly built Seaplane Harbour museum, Pirita & Historic Suburbs 75 minute tour is your next best choice. You can also pay a visit to Open Air Museum or Zoo on Open Air Museum Tour. All tours are included in just one ticket (museum entrance not included in ticket price). City Sightseeing Tallinn introduces attractions, history, present days in eight different languages. It is a fun and learning experience. We offer our tour in the following languages: English, French, German, Italian, Finnish, Swedish, Russian and Spanish. Save time and book your ticket now! So much to do – so little time! 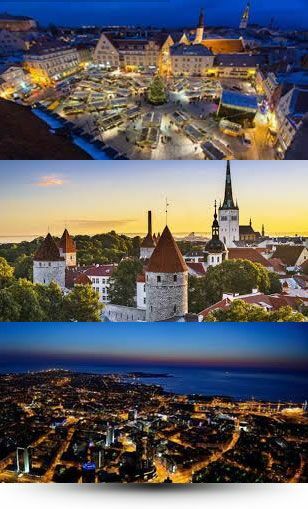 Tallinn has much to offer and we strongly recommend that you pay a visit to www.tourism.tallinn.ee where you can learn more about Tallinn and our many attractions. We wish you a pleasant stay and look forward to seeing you in Tallinn.